Hey everyone! 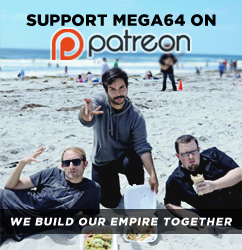 In this week's podcast we spend some time reminiscing about Mega64's first Comic Con, we also talk about going to it when we were kids. Also, Rocco tries to convice Derrick that Boba Fett killed Luke's Aunt and Uncle, while Derrick tries to convince Rocco that Storage Wars is real. That, and so much more! Check it out! Click here for the audio! That's all for now! Come back soon for some exciting updates!